I always wondered why my mom waited until she was 46-years-old to have me. And when I became an adult, I recall asking her why she waited so long to have a child as well as whether she had any concerns about giving birth to a Down syndrome baby. Her response was, it was God’s wish and she never thought about the risk of having a child with a disorder. But like many people, I have always been aware that when it comes to having kids, a woman’s fertility decreases with age. Being pregnant at 35 or older may be riskier for the baby. And there is evidence that an older pregnant woman may be at a greater risk of having a baby with Down syndrome. Well in my case, my dad was even older. He was in his sixties when I was born. But that wasn’t concerning to me. I always accepted that a man’s age did not affect the health of his kids. They did not have a biological clock, right? I was wrong! 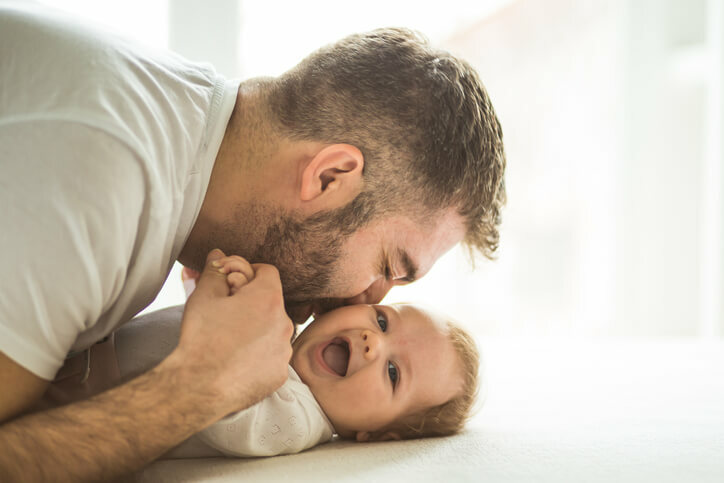 A recent research project where data was pulled from more than 40 million births in the United States revealed that in general men who have kids at an “advanced paternal age” may have riskier pregnancies with their partners. These babies born to older fathers had increased birth risks such as seizures, low birth weight and need for ventilation immediately after birth. And “advanced paternal age” is not as old as you may think. Men older than 35 are considered to be of advanced paternal age. So a man who is just 36 may have a higher risk pregnancy with his partner compared to a man who is 30. “We tend to look at maternal factors in evaluating associated birth risks, but this study shows that having a healthy baby is a team sport, and the father's age contributes to the baby's health, too," Dr. Michael Eisenberg (associate professor of urology) said, in a report on the study. Moreover, the older the father, the greater the risk. “For example, men who were 45 or older were 14 percent more likely to have a child born prematurely, and men 50 or older were 28 percent more likely to have a child that required admission to the neonatal intensive care unit,” the report states. Recent evidence also shows that American men in general are becoming dads at an older age. A 2017 study found that in 1972, the average age of fathers to newborns was 27. Now the average age is around 31. Furthermore, “Of the roughly 4 million births each year in the U.S., about 9 percent of fathers are over 40." And "about 40,000 newborns have a father over the age of 50,” one of the lead authors of another study said in a report. We’ve seen this trend occur in celebrity fathers. Eddie Murphy recently became a dad at 57, Billy Joel had a child at 63 and actor Jeff Goldblum became a first-time dad at the age of 62. The saying, “age ain’t nothing but a number” may not be the case when it comes to having kids, but this all does not mean that men should rush into fatherhood. Dr. Eisenberg said the birth risks associated with babies being born to older fathers are still relatively low. Perhaps so low that he compared it to buying one lottery ticket versus two tickets. Either way, the chances that you will win the lottery are very slim. But I think one of the most surprising conclusions from this study is that with every year that a man ages, he accumulates on average two new mutations in the DNA of his sperm. We have previously discussed the importance for men of all ages to keep their sperm as healthy as possible by maintaining a healthy weight and getting an adequate intake of essential vitamins and minerals, like vitamin C, folate, selenium and zinc. Smoking tobacco may damage the sperm’s DNA. Heavy alcohol consumption may also be linked to poor sperm quality. Another big takeaway from the study was that a father’s age also may play a role in the health of the expecting mother. “What was really surprising was that there seemed to be an association between advanced paternal age and the chance that the mother would develop diabetes during pregnancy," Dr. Eisenberg said. The partners of men 45 and older were 28 percent more likely to develop gestational diabetes, compared to fathers between the ages of 25 to 34. “Eisenberg points out that possible biological mechanisms at play here are still a bit murky, but he suspects that the mother's placenta has a role,” according to the report. As with many things surrounding health, aging often plays a factor. But information such as this is empowering, because there are many steps you can take to increase your chances of having a healthy child despite your age. Young or old, male or female, it is important to eat healthily, maintain a healthy weight, avoid drugs and smoking, drink in moderation (if at all) and get regular exercise. I consider myself lucky to have essentially been the healthy product of two older parents. But I have detected some genetic issues which I needed to address such as the predisposition to have diabetes, heart disease, depression and obesity. I have no clue at this point whether I would have had these issues with younger parents. However, being aware of these tendencies has allowed me to be proactive and prevent those genes from expressing themselves. As we have said before, your genes are not your health destiny! Finally, if you are trying to start a family it might not be a bad idea to take a comprehensive nutrient test. Doing this will help identify whether you have any nutrient imbalances or deficiencies. If you do, a competent healthcare professional can work with you to adjust your diet and possibly recommend good quality supplements. You want your body to be nutritionally balanced before trying to conceive a baby. Doing this will help lay the foundation for a healthy child.